FULL TIMECollingwood have recorded a fighting win tonight at the MCG to force their way back into the top 8. 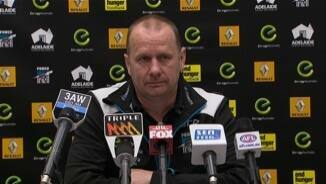 They held off Port Adelaide to win by 6 points. GOAL POWERMoore marks 40 metres out and he kicks the goal to reduce the margin down to 6 points. But it's too little too late with the siren about to sound. Just two minutes stands between a spot in the top 8 for Collingwood. Two goals is the margin and even a behind will surely seal the deal for the Magpies. BEHIND POWERLobbe taps it down to Robbie Gray who snaps but is put off by Goldsack and the ball goes through for a behind. Collingwood leads by 13 points with just under five minutes remaining. BEHIND POWERThey kick it back to Schulz in the exact same position as his previous kick. On this occasion he kicks it higher, but it is punched through for a behind. Schulz is pushed in the back and lines it up from 52 metres out. The kick looks straight but it falls short and is punched back into play. BEHIND MAGPIESBroadbent drops a mark he should have taken and fumbles the ball over for a rushed behind. Collingwood have done everything in this final quarter bar seal the result. Another goal or two should seal that with just under eight minutes remaining. BEHIND MAGPIESCloke takes a magnificent mark overhead. He goes back and the kick does look good off the boot, but not good enough. Handy point perhaps? Magpies by 13 points. BEHIND MAGPIESElliott marks on the 50 and will line it up for a shot at glory. Eliott's shot starts straight but drifts to the right. 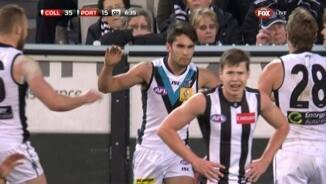 Goldsack is pushed into the behind post by Wingard and he lands on his backside. 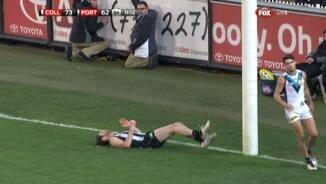 You need more than a piece of padded wood to keep Goldsack down. He shakes it off and gets straight back up. 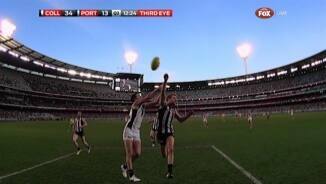 GOAL MAGPIESLumumba kicks to Cloke who cannot take the mark but it doesn't matter. Sidebottom is there at the back of the square to tidy up and kick the goal! Collingwood by 11 points. Dayne Beams and Scott Pendlebury share the leading disposal gatherer tag tonight with both players accumulating 26 possessions. Collingwood are showing some poise but it's still early days in terms of this final quarter and there is still a long way to go. 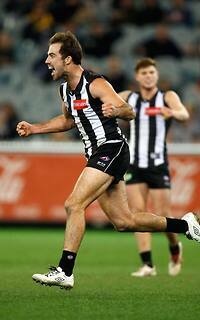 GOAL MAGPIESIt's Cloke vs Carlile in a battle of strength. How strong is Cloke? Carlile was wrapped around him but Cloke still takes the mark. He kicks the goal and the Magpies are in front. GOAL POWERPort have rolled the dice and Monfries kicks the first goal of the final quarter. That puts them back in front and there is a thrilling final quarter ahead of us. SUBSTITUTION MAGPIESCollingwood have activated their substitution with Ben Reid sitting the rest of the match out. Kyle Martin comes on. 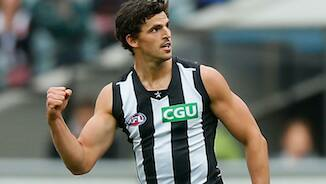 Magpies InterchangeBrent Macaffer off due to an injury. Welcome to MCG for the Collingwood v Port Adelaide Round 19 clash. COLLINGWOOD is back in the top eight after outlasting Port Adelaide and prevailing by six points in a scrappy, but pulsating clash at the MCG on Sunday evening. The Magpies didn't waste the opportunity to move past Adelaide after the Crows slipped up on Saturday, also overtaking Gold Coast to now sit in eighth spot at the end of round 19. Entering the fourth quarter with just a five-point lead, they were tougher and more desperate when it mattered, working back into some form to win 11.10 (76) to 10.10 (70). Midfielders Dayne Beams and Scott Pendlebury were brilliant for the victors, controlling the stoppages to finish with 32 and 27 possessions respectively. While Kane Cornes was generally responsible for Beams at stoppages, the Power didn't run a hard tag on the game-breaker until halfway through the second quarter when he was well on his way to a half-time tally of 20 disposals and eight clearances. Beams motored on after half-time to finish with a game-high 10 clearances, with Collingwood winning the important centre clearances 13-5. Travis Cloke was the dominant key forward on the ground, kicking three goals and taking 10 marks in an entertaining duel with Alipate Carlile. 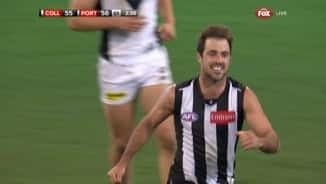 Steele Sidebottom also hit the scoreboard with two goals to go with his 31 disposals, while tagger Brent Macaffer limited the influence of Port skipper Travis Boak, who finished with 23 touches. Entering the match with five losses from their past six games, coach Nathan Buckley said it was the best the Magpies had played since they hit the first bye sitting in fourth spot back in May. "It's the best we've played for 10 weeks and it came when we needed it," Buckley said. "With an element of youth in the side it's easy to get caught up in win-loss and you take your eye off the ball in regards to how you need to go about it. "I thought tonight was a better performance, but there's still plenty of improvement for us." 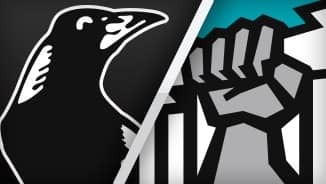 Despite coming off a bye last week, Port was off its game in the first half and unable to generate any of its customary run, falling 21 points behind late in the second quarter. The Magpies were wasteful, however, and they left the door ajar for a second-half fightback. Port midfielder Hamish Hartlett, who was his team's best player, booted three goals in a 10-minute burst early in the third term, including a brilliant 55m effort on the run. Midfielder Brad Ebert, defender Cam O'Shea and forward Justin Westhoff, who moved to half-back after half-time, were also important in the Power fightback. 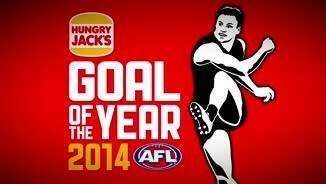 Coleman Medal leader Jay Schulz was well held by Jack Frost and booted just one goal to take his season tally to 53. Key playmakers earlier in the season, Chad Wingard and Jared Polec had just two and three possessions respectively in the high-pressure final term. With a 187-191 kick to handball ratio, Port coach Ken Hinkley said his team handballed too much and players consistently put their teammates under pressure. He said the team had lost confidence with just one win to show from its past five matches. "That's not easy to recover, but it's something you've just got to keep working at to recover," he said. "I can sit here and pretend that they're close losses – that's what the scoreboard would tell us – but at the end of the day it's the way we've played and the way we've looked. "We're not playing with the confidence we had in those first 10-12 weeks." With Collingwood's finals aspirations still hanging by a thread, Buckley is certain to demand more from his men if they are to figure in September. The Magpies face West Coast at Patersons Stadium on Sunday. The Power are now a game adrift of the top four and host the Sydney Swans at Adelaide Oval in what shapes as a season-defining clash next Saturday night.